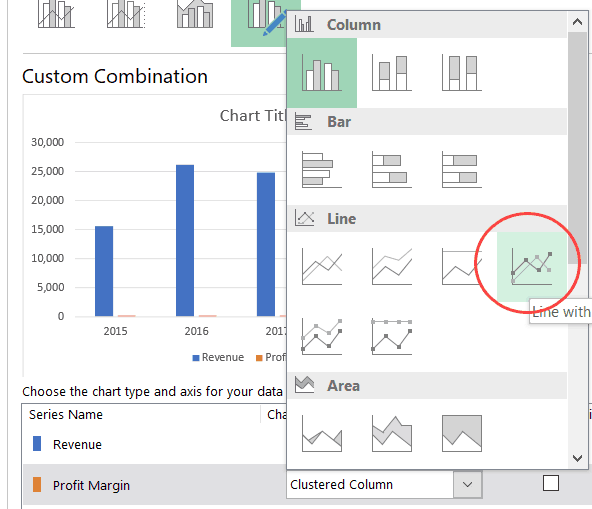 Combination charts in Excel let you present and compare two different data-sets that are related to each other (in a single chart). 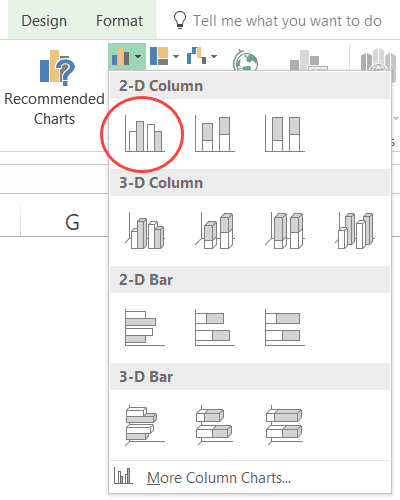 When you create a regular chart in Excel, it usually has only one X-axis and one Y-axis. But with combination charts, you can have two Y-axis, which allows you to have two different type of data points in the same chart. 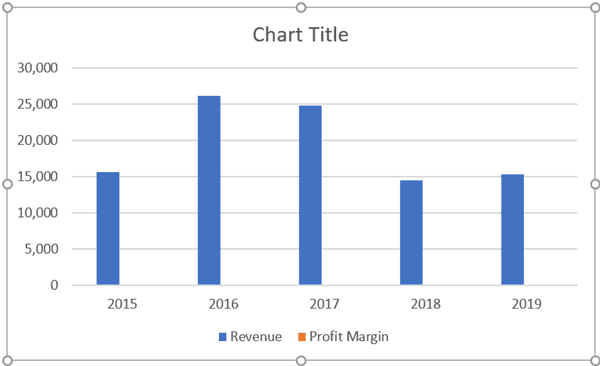 For example, you may be interested in plotting the annual revenue numbers of a company, and at the same time, also be able to show how the profit margin has changed. A combination chart (as shown below) is a good way of doing this in Excel. You can see that a revenue number are in thousands and are way higher than the profit margin numbers (which is in %). 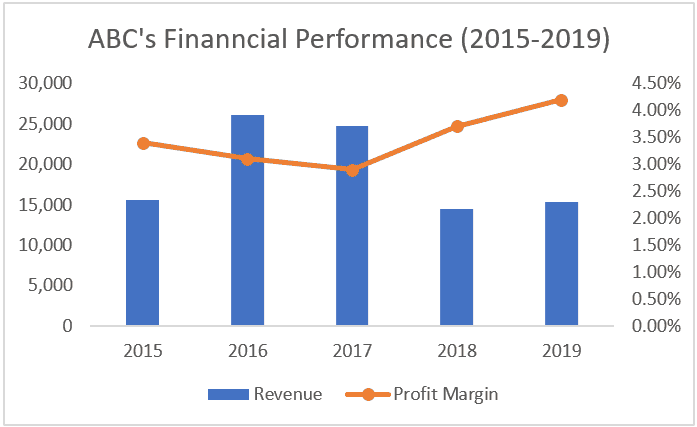 By adding a secondary Y-axis, we can plot the profit margin numbers separately (and still be able to plot both in the same chart). 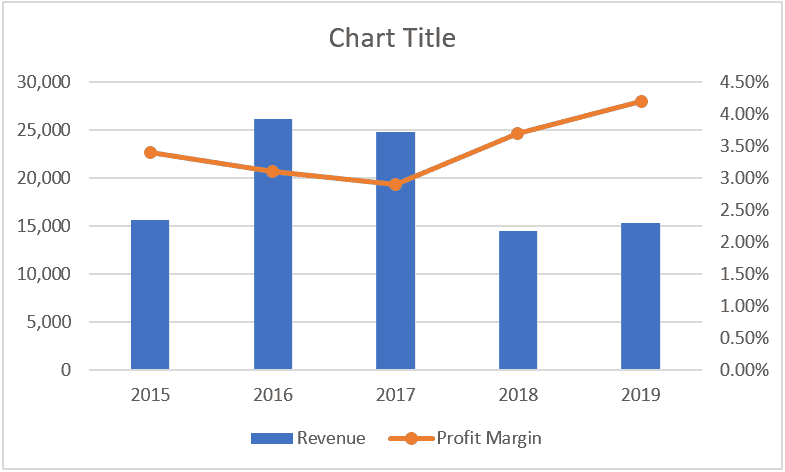 Suppose I have the data set as shown below and I want to plot both the revenue and profit margin numbers in the same chart. To create this combination chart, I first need to create a regular chart where I have all the above data plotted on it. Select the Revenue and Profit Margin data (B1:C6 in this example). In the Charts group, click on the ‘Insert Column Chart’ icon. 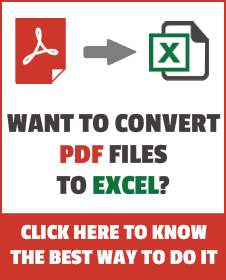 Click on Clustered Column chart. This will insert the chart in the worksheet area. With the Chart Selected, go to the Design tab and click on Select Data. 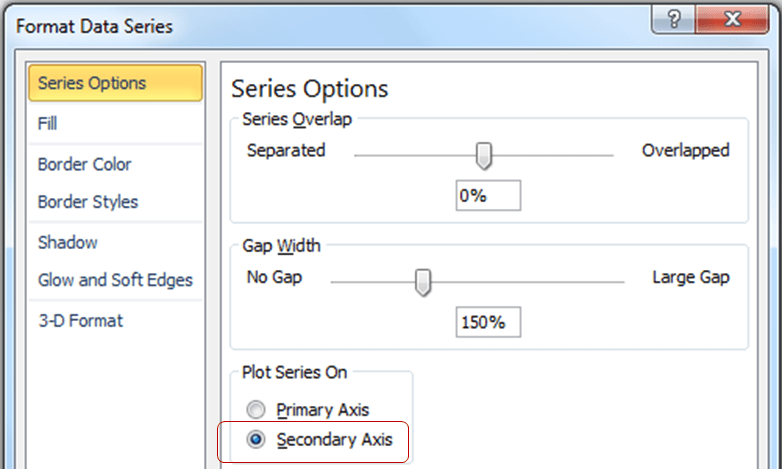 In the ‘Select Data Source’ dialog box, click on Edit option (below the ‘Horizontal (Category) Axis Labels’). Select years that you want to plot in the chart (A2:A6 in this example). The above steps would give you a chart that has revenue and profit margin plotted as a clustered column chart. If you can’t see the Profit Margin bar in the chart, it’s because the value of Profit Margin is very less as compared to the Revenue value (but it’s there as we can see it’s listed in the legend in orange color). Right-click on any of the bars. 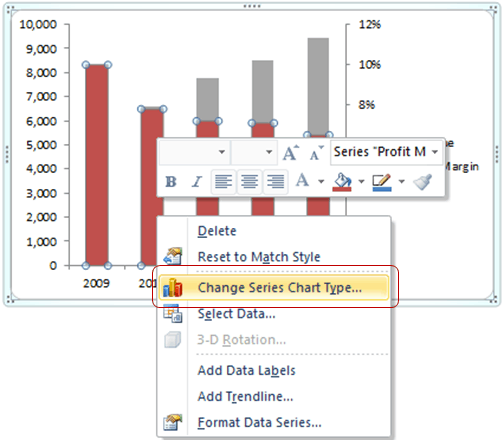 Click on ‘Change Series Chart Type’. In the Change Chart Type dialog box, make sure Combo category is selected (which it should be by default). Click on the drop-down for Profit Margin. In the drop-down, click on ‘Line with Markers’. Check the Secondary Axis checkbox for Profit Margin. The above steps would give you the combination chart (also called combo chart) as shown below. Another good use case of creating combination charts is when you have to show actual vs target values in the same chart. You can create a simple clustered column chart, or create something more fancy by converting one bar into markers. Click here to read how to create an Actual vs Target combination charts in Excel. 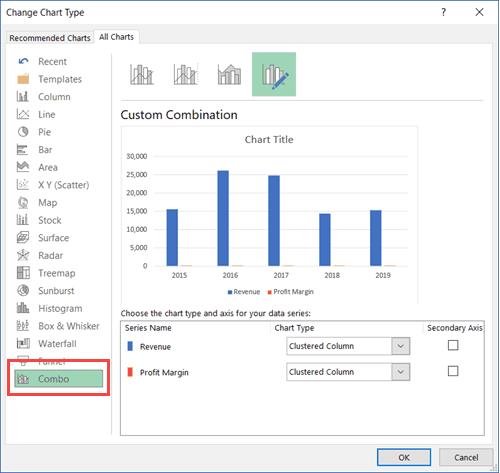 While the first part of creating a chart is the same in all versions of Excel, converting that chart into a combination chart is done a bit differently in Excel 2010. Click on any of the Profit margin bars. This will select all bars for profit margin. 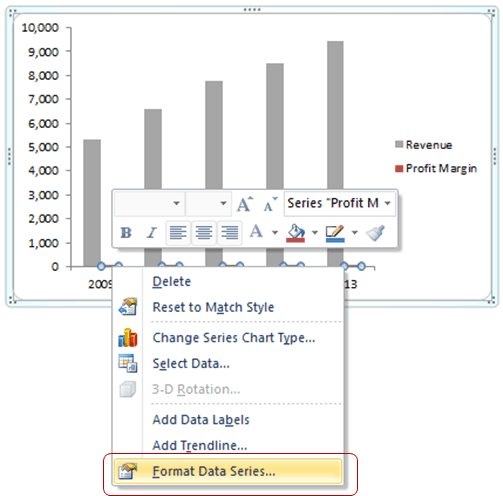 Right-click and select Format Data Series. This will plot Profit Margin Data in a secondary Axis. You would be able to see a vertical axis on the right of the chart. 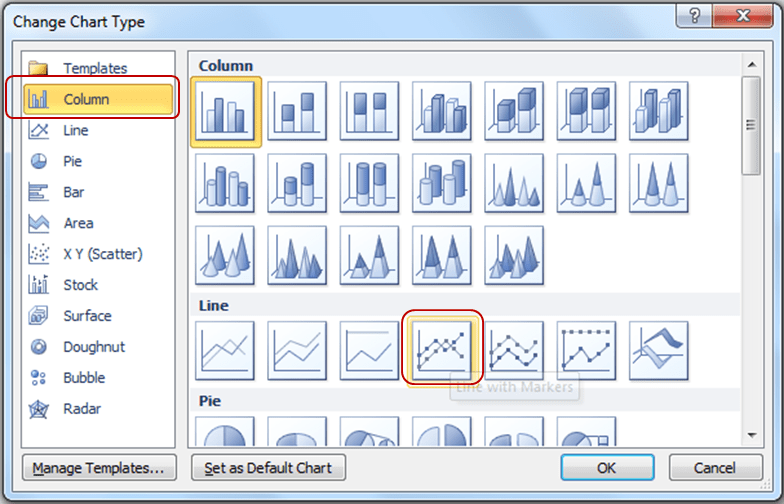 In the Change Chart Type dialogue box, select Line with Markers option. That’s It. You would have the chart. Format it the way you want. Creating Combination charts using Checkboxes. Creating Actual vs Target Chart in Excel. 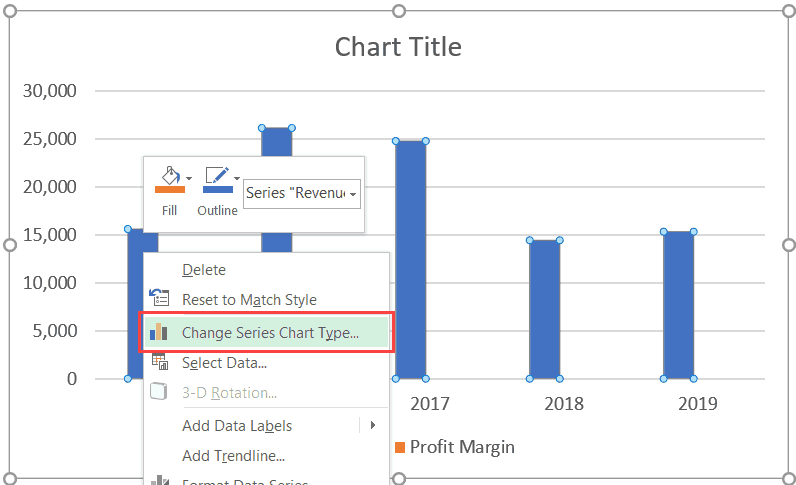 Add a Trendline in Excel Charts.